September 14, 2017 in Community // Fire, Fire, Fire! August 14, 2017 in Community // Beat the Heat! August 10, 2017 in Features // What’s With the Heat!? The aircraft carrier USS Nimitz (CVN 68) hosted 13 distinguished visitors September 13, to show appreciation for the people who responded to an emergency landing by one of the aircraft assigned to Nimitz. On August 12 an F/A-18-E Super Hornet from the “Blue Diamonds” of Strike Fighter Squadron (VFA) 146 made an emergency landing at the Bahrain International Airport (BAH) after suffering a critical engine failure. The group of visitors was comprised of the first responders who attended to the incident and the personnel from the moving company that moved the aircraft off the runway in order to get the airport reopened quickly. 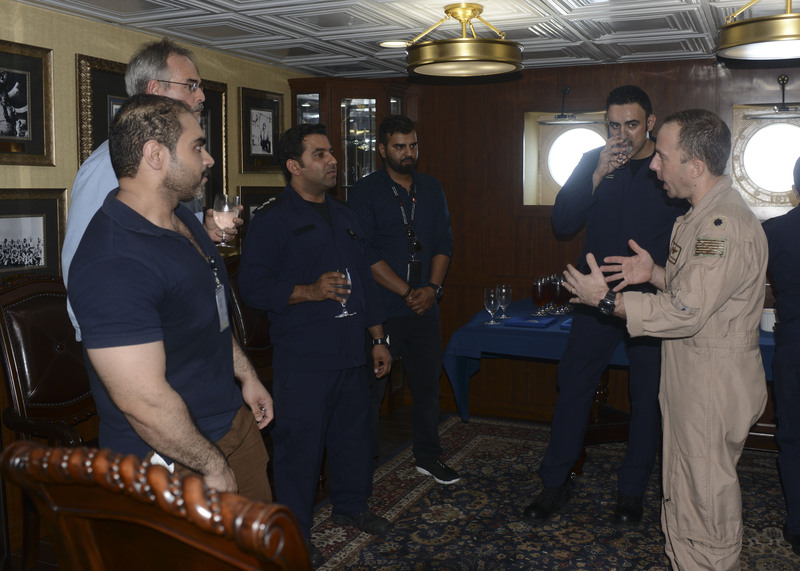 During the first stop of their tour the visitors met with the pilot of the aircraft they recovered and other key personnel who contribute to Nimitz’s operations. After their four hour visit touring spaces around the ship including the bridge, primary flight control and the flight deck where they viewed flight operations, the group departed the ship via a C-2 Greyhound, from the “Providers” of Fleet Logistics Support Squadron (VRC) 30. Nimitz is deployed in the U.S. 5th Fleet area of operations in support of Operation Inherent Resolve. While in this region, the ship and strike group are conducting maritime security operations to reassure allies and partners, preserve freedom of navigation, and maintain the free flow of commerce.